Wow! What a ride it was. It messed with my head and was so, so entertaining. I loved the first book in the series, and I especially loved the audiobook, so I had to listen to the audiobook here too. But I also wanted to enjoy the drawings by Marie Lu. So I combined both experiences, I was listening to the audiobook and following the book at the same time. I loved it, and I highly recommend reading this book like that. Gemina follows new characters – Hanna and Nik. They are completely different from Kady and Ezra from the first book. At first I though I would mind that the main characters are different, but it was not the case. Hanna and Nik had completely different dynamic than Kady and Ezra, and I really liked this ‘will they – won’t they’ dynamic. Hanna is a daughter of a Chief Commander of the Heimdall station. Nik is a drug dealer, he’s dealing dust that House of Knifes is producing on the station. The whole part about drugs, and how they are produced is pretty amazing and adds an interesting aspect to the whole story. Authors really play with the readers, constantly teasing them about characters fate. I was devastated few times to read what happened to my favourite characters, just to learn that it wasn’t actually like that. Now when I look at it, I can see that there was no way that some things will happen like I first thought, but when I was reading the book I was too hooked and emotionally involved in the story to think rationally. And that makes this story so amazing. Lovely review! I LOVED Gemina & have been considering getting the audiobook because I’ve heard only great thinks about the production work that went into a full cast audiobook experience. I most likely will give in do a re-read before the 3rd book is released. Although Kady & Ezra have a special place in my heart…Hannah & Nik are hands down my FAVES! their exchanges were always so funny & made me chuckle a few times on a crowded train smh LOL! 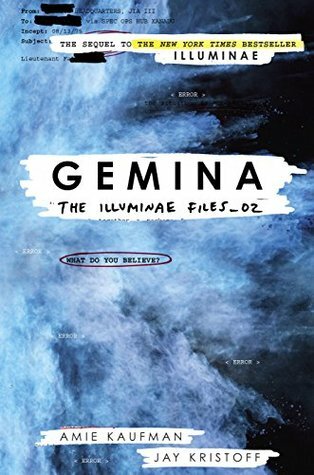 Gemina was the first audiobook I’ve ever been able to listen to. It was such an experience. This book RUINED me, haha. I’m so glad you enjoyed it 😀 Great review! !